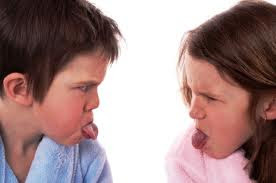 How Does Sibling Rivalry Start? How young does sibling rivalry start? My daughter is a little over one year old. I am seven months pregnant with my son. I was under the impression that my daughter was too young to really grasp jealousy, rivalry, or anything else with a negative connotation. We visited our friends last weekend who just gave birth to a beautiful baby girl. I scooped up the little two week old baby and moments later my darling little angelic daughter mustered a glare on par with Snow White’s step mother. I was quite taken aback. My daughter would not let me near her the rest of the day, and finally started warming up to me a day and a half later. Is this a preview of what is to come? Will she react differently once the baby I am holding is her little brother? Will it make a difference that both her parents are now holding this new bundle of joy and including her in on it? I could not help but feeling that somehow it would have made a difference if I had let her come close up and explore the baby with me. However, this was not my baby, and it was not for me to decide who can and cannot touch her. My husband and I talk to our daughter about the coming changes, but we do not know how much of that makes any sense to her, or how much she understands. We just hope that with love and patience it works itself out within a few months of our son’s birth.